saw this YJ listing for a matched set of Dry Z pickups that ended @ 129,000 yen which is $1,172 at current exchange rate. Those look like fakes to me with the incorrect Z stamp. There are a suspicious sets out there like this one (https://page.auctions.yahoo.co.jp/jp/auction/u228354497) with the square bobbin hole which is not seen on DRY Z pickups. interesting observation Harold about the Z stamp; I wonder if any of the Zs I've owned had a 'fake' Z stamp? Looking at the Z stamps in the two above links I can't really tell any difference; is there something that gives away a 'fake' Z stamp that most here would not discern? Yeah, the sets I have owned only had the two round holes; not the third square hole which is an attribute of the (later) Mint Collection era pickups. there are a lot of 'expensive' pickups on the market that cost a pretty penny; Dry Z are just one of the many examples. Been thru a few sets of Dry Z but they are by no means my favorite humbucker. IMO there are plenty of other humbucker options out there that are much more affordable & that have nearly as good, comparable sonic response. I have one set left but it is very special, and for multiple reasons. I removed them from the original guitar & they have never been installed in any other guitar, yet. Maybe they will never go into another guitar; don't know. According to a gentleman in Europe my last Dry Z set is the latest serialized set he has ever seen & he has owned a few sets himself. Dry Z are (now) quite rare but my set has a feature that makes them extremely rare. It is not myself who bought them but, to be honest, everything seems legitimate for me. Square holes and everything. The first set has the Z a little thick, it's true, but it seems to be due to the movement of the hand, not to the false stamp. It's just that the prices of these Dry-Z are rising inexorably, given their scarcity and quality. Why? Because even if today we buy a set of K & T supposed to be at the same level, it's not true, Dry-Z are above. It's only my opinion, of course. I would take exception to the 'square hole' theory as far as the Dry Z examples are concerned. I know of no Dry Z examples with the third/square hole in the bobbins. IMO it is (somewhat) common knowledge the early DRY 1982 examples also had the two holes in the bobbins, sans the third/square hole. Maybe you're right. I just saw now, after enlarging the image, the third "Square hole". In the same time, the "Z" on the pickup baseplate is correct. IMO the Z is not correct, there are subtle differences. Good attempt though. Here is a picture of Z's in a guitar. Note how narrow the ends of the letter are. It CAN be smudged or have variation due to stamping but IMO buyer beware these days. It CAN be smudged , and IT IS A LOT OF TIMES with Dry Z's. The "Z" stump seem to be correct to me. For ALL the examples we saw here. Don't know for the third square hole. 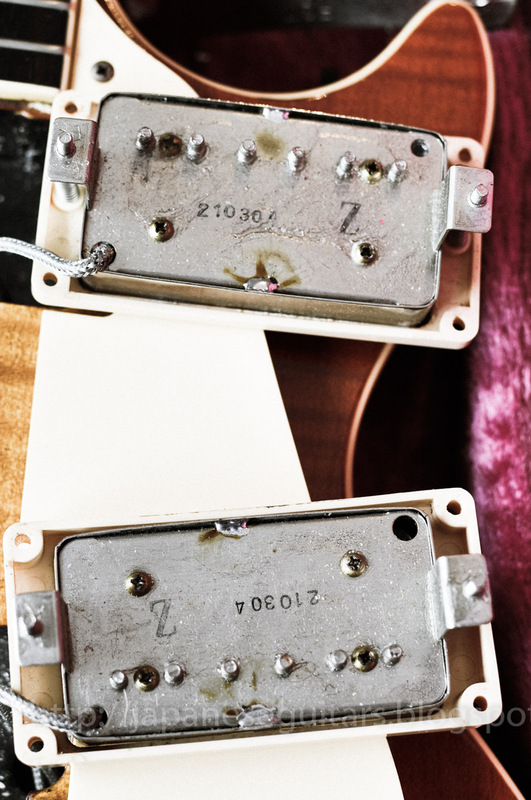 Who knows what is under each pickup cover of dry z's in 1981? Hi Harold, I certainly agree with your point AFA "buyer beware" when looking at the overall set of attributes when considering the purchase of most any item, Dry Z pickups included. Take for example the link you provide in post #2. The base plates look legit with one of the latest serial numbers I have ever seen for a Dry Z. You mentioned the third bobbin hole which I agree is a huge red flag for a Dry Z example. The screw heads are also wrong; they should be single slotted. I guess we can agree to disagree on the Z stamp itself, as I have had examples that have some variance within matched sets. I have also seen this 'font variance' in multiple photographed examples, as Dalko has also provided. AFA the example you provide in post #2: I believe the base plates are legit BUT I believe someone switched out the actual pickups & attached a different pickup to the Dry Z base plates. The serial #s are one of the earliest I have seen for a Dry Z. The claimed meter values of 7.87 & 7.97 are a bit higher than most reported 'nominal' values but are still within noted & reported values. None the less likely the highest values I recall for a matched set. I should have mentioned that the seller with the 3-hole bobbin set also sold 2 more sets recently, all with non-original covers. Not conclusive evidence, but there are tons of Maxon/Fujigen pickups out there to use if a person wanted to make a few sets. All they would need is a similar "Z" and number stamp. Harold, What you say is so true. Many people try and take advantage of others, which is very unfortunate. Your opinions & observations have always been a great help to me, to the Tokai Forum, and to other forums that I won't mention by name here. Needless to say I have the utmost respect for your views, your honesty, and your fairness in regard to all things MIJ. We need more folks like you not only within the MIJ community but also on the entire planet. You will always have my continued respect for your knowledge & your willingness to share your knowledge. I hope one day we can actually meet, in person, share a couple of beers, and play a few riffs on our favorite axes!! Can I just jump into this thread with my example of a set of Dry Z (or not). I bought a set 10 years ago from a well known Japanese guitar dealer on this site. They look identical to the ones posted by Wulfman in post 2 with the two round holes and the third square hole at the edge. They also don't have pickup covers (obviously otherwise I wouldn't be able to see the bobbins). It's been so long since I've seen the base plate that I honestly can't remember what they look like, though I'm sure they had the Z stamp. They do have the slotted screw heads for the height adjustment though, rather than the Phillips head - but this could be simply something that has been replaced on the example pickups and I wouldn't put too much stock in those (they have been knocking around for nearly 40 years after all). I will say that they sound fantastic, and I have another set of Dry Zs in a 1980 SA-1200 to compare them with and I've never felt that they weren't genuine before reading this thread. It would be interesting to see ALL attributes of the three hole bobbin examples you speak of: the Z stamp, the serial number stamp, etc. Screws can be changed, easily.